Lietzke custom design and manufacture hinged metal clad Fire rated doors and frames to customer specification and to meet the Australian Standard (AS/NZS 1905) and Building Code of Australia (BCA). The door units are supplied complete with the door leaf mounted into the frame and with all fire rated hardware fitted. 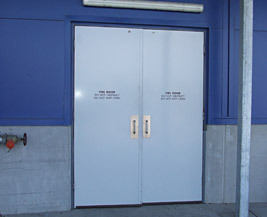 The doors can be rated to 1, 2 or 4 hour fire rating. The doors can be further customised with smoke seals, fire rated windows and a range of fire rated door hardware. Applications include a wide range and include residential, commercial and industrial applications. Standard finish is Colorbond colour ranges. Fire rated devices and hardware can be factory fitted. Internal and external edge capped are available. Lietzke can custom design and manufacture a 1.6 mm fully welded BW Style frame for architectural applications to suit the required wall thickness. 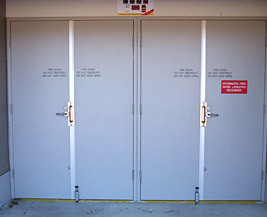 Door shall be a Lietzke Metal Clad Fire Rated Door of 1 (2 or 4)* hour fire rated with Colorbond facings. Door to be supplied hung in a Lietzke BW series 1.6 mm fully welded Zinc anneal Frame with Hardware and Seals pre fitted*.